Nothing has had a bigger effect on my life than starting my blogs in 2014. I’m not exaggerating and it’s not hyperbole. Blogging has allowed me to create a work from home business to control how much I make and literally reach millions of people a year. …and the money is pretty nice also! I made over $85,000 last year, less than four years from starting blogging. That was 27% more than I made the year before and it looks like I’ll hit that six-figure income this year. I love the sense of community I get from other bloggers and I want to bring you into that world. Together, we can be more successful than either of us imagine…but you have to get started. That’s why I put together this five-part free blogging course to share everything you need to get started blogging and making money. I’ll walk you through step-by-step from starting any type of blog to getting traffic and the income sources I use. I’ve linked all five blogging videos in the post below to guide you through getting your blog online. I’ve also put together a free blogging checklist that will guarantee your success. The checklist is completely free, just click through the link below and use it to follow along with the videos. This first video walks you through everything you need to get your blog online in less than an hour. I’ll show you how to pick a blog topic that makes money and how to narrow it down to become an authority fast. I’ll then show you how to set up a blog and the easy tech tools that allow anyone to be a professional blogger. Get this special offer from Bluehost, the lowest price on the internet. Get your blog name and get it online for less than $3 a month. Choosing a blog topic is more important than most new bloggers know. This is not only going to be five or ten hours a week, it’s also going to influence how much you make with your new online business. Certain topics like health & fitness, personal finance and relationships tend to make more money. People are willing to spend a lot of money when it comes to these parts of their lives so if you can find a blog topic here, you’ll be on your way to a more profitable blog. Even if you don’t want a blog in one of these topics, you can still make money. I’ll reveal my five favorite income sources for bloggers in the fifth video below. Getting your new blog online means registering the website and getting webhosting. Webhosting is just the service that holds your blog on a server, then delivers it over the internet when people want to visit the site. Fortunately, this is also one of the easiest steps to starting a blog. 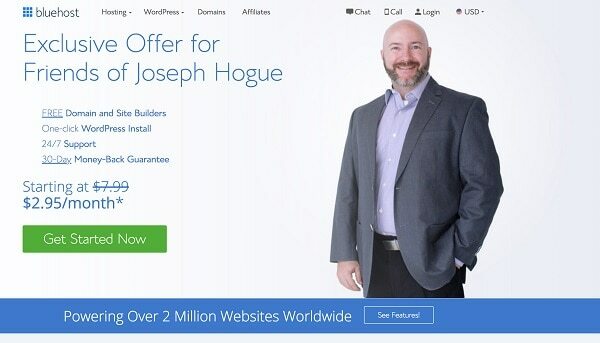 The webhost I use, Bluehost, makes everything pretty much automatic. I explain it in the video but getting online takes less than five minutes. Go to ‘Settings’ then ‘General’ in the left-side menu and change your Site Title and Tagline. This will show up in Google when your blog appears in search. In ‘Settings’ go to ‘Permalinks’ and check Post Name so your post URLs are only your site name and the post name. Go to ‘Appearance’ and ‘Themes’ to test out a few free blog themes until you find a good one you like. In ‘Appearance’ and ‘Menus’ decide how you want your site menu to look. Plugins are just software created by companies that allow bloggers to do something without having to be technical. A good example is the Akismet plugin, which filters out spam comments from your blog. Without the plugin, you’d either have to write your own computer program or sift through hundreds of spam comments every day. Most blogging plugins are free to use though they’ll ask for a donation. Some have premium levels though you’ll get most of what you need with the free versions. Below are the plugins I recommend to all new bloggers. The biggest reason most people never get started blogging is they think they can’t write or that blogging is too hard. As someone that never liked English in high school and couldn’t write to save his life, I can tell you that you don’t need to be Shakespeare to be a successful blogger. In this video, I’ll show you how to make blogging easy. No lie. I’ll start by showing you how to always know what to write about and never run out of ideas. Then I’ll reveal the simple process to make writing easy, even for non-writers. As a blogger, your content strategy is the type of articles and topics you post on the blog. The type of article might be a list article, interview, reader questions or news. Using different types of posts keeps things fresh and interesting for your blog readers. The other part of your content strategy is the topics on which you write. How narrowly you plan your blog will determine the love you get from Google search and the readers you attract. My recommendation is to start as narrow as possible, covering one niche from as many perspectives as possible. This will make you the ultimate authority in the topic and create a loyal following. After doing that, you can expand out into other topics. Making blog writing easy is a matter of knowing what you need to talk about and organizing it in a template you use every single time. Google makes it easy to know what to talk about, just do a search and see what is already being discussed. With that research, you can decide what else to include to add to the conversation. The actual writing part of blogging is easy, especially once you get the feel for the template I share in the video. Again, Google will be your guide because there are certain things it looks for when ranking posts. You’ll want a headline and section headings to tell Google what the post is about. Within each section, make sure you include bullet points and relevant images to break up long blocks of content. For new bloggers, social media traffic is the most important thing in the world. You’re not ranking much in Google for the first month or two and direct traffic to the blog is nil. It’s social media traffic that you can build quickly and get that first motivation to keep blogging. In this video, I’ll give you an overall social media strategy as well as a way to boost blog traffic on each of the major social platforms. I’ll show you how to take advantage of the differences on each platform to bring in more visitors and make more money. Your strategy for getting traffic from social media will vary depending on the platform but there are a few things to keep in mind that will determine an overall strategy. Before anything, remember that social media is about being ‘social’ and engaging with your community. Too many bloggers simply spam out their links and then wonder why they never get any traffic from social. Make your blog as shareable as possible by including quotes, images, infographics and videos when possible. Use a social media plugin that floats on the screen when readers scroll, making it easy to share. Keep a list of bloggers you know and their articles you can share. Include their social handles in each share and they’ll share your articles with their community as well. Focus your social media strategy on just three or four platforms. Engage with individuals and groups to really build a community. Beyond the overall strategy you use on social media, there’s a tactical component to social as well. This means the types of posts you share and how they work together to maximize blog traffic and community building. Approximately four-in-ten posts you share on social media should be promoting your blog posts with direct links. Two- or three-in-ten posts should be shared content from other bloggers. This shows your community that you have their interest in mind and gets your content shared by other bloggers. Two-in-ten posts can be sharing blog articles that are highly monetized. You don’t want to overdo these but you have to make money. One- or two-in-ten posts should be community building posts with no links, only to start a conversation on the social media platform. Besides starting a social strategy, start building an email list from day one. The subscribers on your list are going to be your most loyal visitors. They’ll not only visit and share your posts regularly but they’ll be your first customers. I’ve used lots of email providers but none come close to the kind of value and features as ConvertKit. If you asked me the one thing that has helped me grow my blogs faster and make more money, I would have to say devoting some time to blog search engine optimization (SEO). SEO is what you do to rank your blog posts on Google. It involves everything from how you write your posts to some things you can do on other sites to get more Google search traffic. The reason why this is so powerful is because hardly anyone does it. Whether laziness or because they think SEO is too complicated, most bloggers completely neglect this part of blogging. In this video, I’ll teach you everything you need in the two types of blog SEO to boost your rankings on Google. I’ll reveal strategies I’ve learned over years of blogging and one SEO trick I use to boost traffic four-fold. On-Page SEO is the keywords you use to write your articles and how you set up each post. This is fairly easy and works into that writing process I showed you in the second video. It also works into the social media strategy we discussed by making your posts shareable and linkable. Off-Page SEO is what you do off-site to get links and boost your ranking. This is the part that most bloggers avoid because of the time and effort it takes. These strategies will take a little extra work but they will get your blog ranked on Google and will bring you hundreds of thousands of visitors a month. Guest posting is easy because it’s just providing an article for other bloggers. If you’ve been sharing other bloggers’ content on social, they’ll be happy to host an article of yours on their site. You can include two links in your article pointing back to different articles. These will act as a sign of authority to Google for each of those articles. Broken-link Building is a very effective strategy and can get you dozens of links. It’s a longer process and one I share completely in the video. This is one every blogger needs to try! There are some types of blog posts that attract links like a magnet. They might take a little longer to build but these are the articles that will be crucial to the growth of your site. Republishing is a great blogging tool and it works on so many levels. Not only does this strategy boost traffic to a post by an average 400% but it frees up my time when I’m too busy to write an article. Find an article at least six months old and getting some Google search traffic to republish. Research Google to find more information to update and improve the post. Add images, links to relevant posts and any relevant affiliates. Republish the post and share it out just like a new post. Want more ways to boost your blog on Google? I walk you through my entire SEO process in the book, SEO for Bloggers. Get your copy on Amazon Kindle. This is the video you’ve been waiting for, how to make money blogging. Blogging is a business and it’s important to make money. 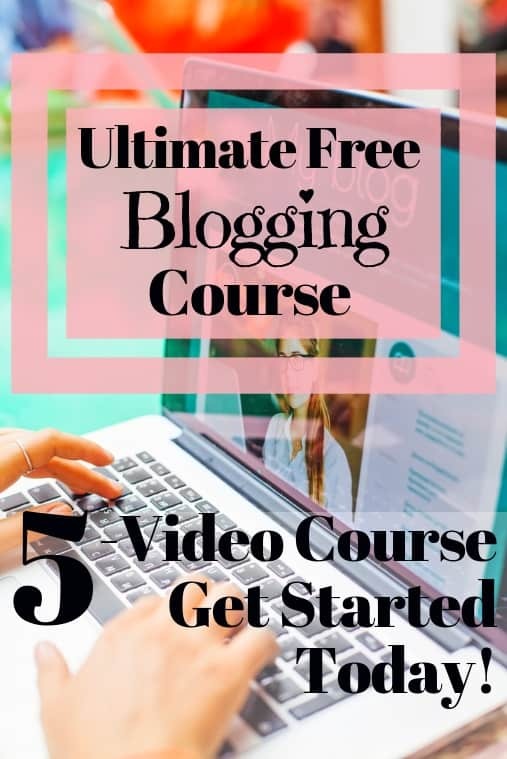 It’s just as important that you have everything set up before you try making money though, that’s why I waited until the fifth part of our free blogging course to reveal the five income sources I use on my blog. In this video, I show you how much bloggers make and reveal how to get started in multiple income sources to diversify your blog profits. One of the most important things you can do is diversify your monthly income through different streams. 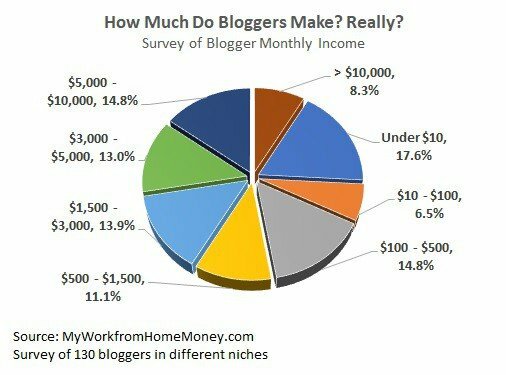 Few blogging revenue sources will make you rich and many are volatile from month-to-month. The secret is to build three or five sources to the point they are providing a consistent income that can reach six-figures. Affiliate marketing is the base of most new blogger’s income. It works so well because you don’t have to spend the time creating your own product. Concentrate on a few affiliates that resonate with your readers and then focus on two types of posts, reviews and lists, to make as much money as possible. Sponsored posts are another great income source because it’s guaranteed money. Start at $100 or more for a post and raise it as your blog grows. Create a media kit you can use to justify your price and negotiate for longer-term partnerships with brands. Self-publishing needs to be in your blogging strategy from day one. You’re already producing the content, it’s effortless to reformat it into a book and make money every month. Use your blog strategically to develop and market your book. Membership sites are a great source of recurring income you can count on every month. Concentrate on creating a community around the membership to keep people coming back every month. That means treating it like a social media site and focusing on engagement. Get the nine income sources I use on my blog from ads to self-publishing and webinars, all in one book. Make Money Blogging is the last book on getting paid to blog you’ll ever need. Get your copy on Amazon Kindle or paperback. I’ve tried to make this post as detailed as possible but there’s only so much we can cover. Click through and watch the free blogging course videos. Get your free checklist by clicking here for the step-by-step to each video. Blogging can change your life just as it did mine. Blogging is a business and you need to know how to run it just like any other type of business.